FAQ: Do you have an example of a drapery motor installation? Drapery and curtain motorized remote control operation is something our clients have been asking for, ever since we introduced our roller blind and shade motors a few years back. We decided it was time to introduce a DIY kit for opening and closing drapes and curtains. This is an excellent home automation example by a very talented fellow in Australia (John) who used our CurtainCloser™ kits to automate his vertical blinds. What follows is a narrative of the overall system he is installing, including both sides of the discussion. What is the shipping cost for 1 Drapery kit and for 4 kits? We often ship to Australia by Canada Post expedited parcel (with insurance and tracking), and we enjoy doing business with our Commonwealth friends. The cost is 89 regardless of how many units you purchase. This covers the minimum shipment cost, and it takes 7 to 10 days. If you would like to place an order, please let me know what you need and I will prepare a Paypal invoice that you can pay online with your credit card (no need to login) or your Paypal account. If I can be of further assistance, please contact me any time. The plan is to purchase 4 Drapery controllers to open and close 4 sets of vertical blinds. I'd like to tilt the blinds as well but will probably stick to just opening and closing. I'm into Arduino stuff so the RollerNode controller looks ideal for what I want in regards to using a light sensor and temperature sensor to automate opening and closing to suit day light hours and season. Please prepare a Paypal invoice for 4 Drapery controllers and a RollerNode. My suggestion around this will be to use our radio motors as we now have modified our wall mount switches to accept external relay controlled triggers. This means you can use our standard radio remotes, and also control it via relay attached to whatever system you like. Soon we will also have a new version of the RollerNode with on-board relays that will have an IP address that can be controlled with a system like Vera (or directly from any browser, including phones. You mentioned Commonwealth. That suggests you are Canadian. I had 2 very enjoyable 3 month periods of work in Toronto either side of 9/11. It was very emotional leaving the second time. BTW, I live 16 km from the Melbourne CBD and have 1.5KW of grid power, 8KW of off-grid solar, 4 tonnes of batteries and 16K litres of underground water for geoexchange. The wind turbines were ineffective and are gone. The extension is intended to make best use of passive solar heating. Hi John, this is very interesting to me, we are very big on solar and alternate energy here. I have been using PV systems ever since I built a solar powered steam generator in 1972 as a demonstration project when the Arab oil embargo was on. Yes, we are Canadian, and I lived in Toronto for a couple of years, but we are now situated on Vancouver Island. I am British by birth, but we emigrated to Canada in 1957 and I grew up in Vancouver, which I understand is quite similar to Melbourne (at least in climate). Melbourne and Vancouver keep swapping the "Most Liveable City" mantle. I have been to Seattle and can guess from my experiences in Canada and the feedback from the members of my team that went to Vancouver before Toronto that it must be a nice place. The blind company I'm dealing with automates most blinds but for vertical blinds goes to a company in Germany and the cost is high and the delay about 2 months. There is an Australia company that does vertical blinds but the price is high. I decided on a retrofit approach. There are plenty of people that have done a half baked DIY job so I soon realised that I'm not doing a 5 year R&D project. Regardless it was clear that the standard pelmets were unsuitable for automation so it was better to take care of this myself as well and based these on your product. I had a consultant from the blind company do a second measurement today after I installed pelmets over the weekend and had figured out roughly what I was going to do about automation based on your drape mover. My problem is that I don't have measurements for either the blind mechanism not the RollerTrol assembly so I'm concerned that the measurements are not right for the combined outcome. Whether you use pelmets (aka cornice boards) or valances, I think you'll find our system to be very adaptable. The brackets have slotted adjustments, and can be mounted in a number of different ways (bolted to rail, screwed to wall, etc). I would be very surprised if you can't easily adapt them to your situation. There are no complicated proprietary tracks or transport mechanisms involved in this (that typically take up lot of room); all you need to do is run your pull cord along the track to the leading edge, and it will work fine. There are 2 west facing blinds and the width of these is not particularly critical as there is section of wall between them. No allowance has been made for the idle sprocket at the northern end of the northern blind. Hopefully the worst case there is that the support channel will need to be cut back a little and there will be no gap. Although the plan was to have 2 blinds for the west facing windows, it may make more sense so have one blind to deal with both west facing windows and the wall. That is probably the cheapest and most convenient approach overall. One drape control (one less unit I wanted you to invoice) and one manual tilt control (more convenient) and slightly better insulation. I'm more concerned with the north facing blinds as I've only allowed 50mm at the west and east ends for the motor assemblies and nothing in the middle for the west and east idler sprockets. There are 4 doors on the north side that open up to about 3.5 metres (out of nearly 5 metres total width) to access a deck so 2 sets of blinds makes more sense than 1 set. The idler sprockets will be in the middle and I'm concerned that this will result in a gap. The blinds are 127mm so hopefully that won't be the case. If it is going to be a problem then I should consider a single set of vertical blinds. Please let me know whether the 2 adjacent sprockets will cause a gap as that means I must change plans immediately. Otherwise I guess it will be simply cut the the guides back. Any advice would be greatly appreciated. Thanks for your feedback. It was just what I needed. I will do the installation myself and get it right. I will take your advice to use one motor to do the northern blinds using a centre draw. However now that I'm doing the installation myself I'll do another window so the number of units is still 4. Please do the Paypal invoice for 4 of the units I referred to before and I will go with them straight away. Hi John, I'm thinking we should have a discussion about the motor type that you need, in light of the solar systems you use. If you go with the standard radio motors, they consume about 20 to 30 mA each, in standby mode while listening for a command. This may not sound like much, but it is a continuous demand that can add up over time. We have a special 'ultra low standby' version that is popular in Australia with other clients that go solar. We also have battery motors that use the same circuitry with an internal battery (no wiring required) that last 4 to 6 months on a single charge. I thought I should check with you on this before we proceed with invoicing; I just want to make sure you get the correct unit for your needs. The extension has stackable double glazed doors that face north and will get the sun in winter and be protected by the equivalent of eaves from the sun in summer. As you suggested, only one motorised unit is needed to deal with centre opening. I can power that (and the west facing windows motors) from a sealed lead acid 12 volt 6AH battery that will be charged from the 12 volt circuit. I might as well go for the low standby power unit but won't need batteries. Our Z-wave interface allows direct control of our motors. The main difference between Vera and Veralite is that Vera has a wifi controller built in, so if you already have wifi, you may want to go with Veralite as they are functionally the same, and messing with a second router may only serve to complicate things unnecessarily. The extension has 2 west facing windows. They are both double glazed and there is about 1 metre of brick wall between them. There will be 2 sets of vertical blinds with the motors in the intermediate wall. The pelmet will cover the north and west blinds and I can conceal the battery in the gap between the west blinds. By using small 12 volt wires to go to the pelmet from the floor the shouldn't be anything to see. The idea is to trickle charge what is a fairly substantial battery from the 12 volt circuit and use a diode to prevent back charge. I also like the idea of using the low power motors on the west windows. The original lounge room windows are an L shape and I wasn't going to bother automating them because of the impact of trees. Now that I've decided to do the installation myself and your advice saves me a motor, I figure the longer window might as well be automated too. Running power there could prove ugly so I think the solar powered battery solution makes sense for that window. I'm not up to speed on the Vera yet. I have to go with the latest and greatest not the "Lite". Nothing I've seen so far gives me any idea of how to program stuff myself. When I'm working I'm not playing with my mobile phone turning things on and off. I want to control operations using sensors. I figure that this is possible as the control is via a Vera web service and I should be able to handle that. yes, certainly ... all kinds of sensors available. We also have a new IP based controller that works with Vera, coming out soon, that can be used for Window openers and other devices. It does temperature sensing too. One of the checks I did was to see what was on eBay. This reveals an issue with the RF frequency and I guess that means I can't go with your motors and an Australian approved VERA. The Vera control stuff I saw suggested using a Rasberry PI. FYI the Australian company that I have used for a lot of Arduino products has recently announced a product to use the capabilities of the Arduino with the power of the Rasberry Pi. I have had a lot of experience with them and the programming is not trivial, and it is very low level compared to Vera's graphical interface. FYI there were 3000 lines of code for my Arduino solar/wind controller until I ditched the 22 Mosfet 12/24/36/48 volt charging from the wind turbines. There was data logging to an SD card and data could be retrieved from any computer of the local network. However my day job is mainly writing code and your caution makes a lot of sense. The 12 volt lighting will be controlled by push buttons that replace the conventional switches. The bricks are exceptionally hard so the tracks chipped out for the cables down the walls were not all deep enough. The guys hammered the steel conduit flat in places so replacing wiring is difficult. By using the Arduino I can not only use the button press for toggling between on and off but also to dim then brighten etc when the button is kept pressed as well as keep track of the desired dim level. Thanks Adrian. I really appreciated your assistance - and the Canada reconnect. I've taken the day off to lay carpet tiles as it is a warm day and I can put the furniture out on the deck. It will rain on the weekend. It looked as though I would need to have one reflective acrylic sheet sandwiched between the double glass and a clear acrylic sheet for the west windows. However it looks as though I can get reflective roller blinds to put down during the Summer. There would be 4 that are about 800mm wide and 2000mm long. The 2 west facing windows each have 2 panes of double glass with a 45mm piece of timber between the panes. The depth of the timber is 90mm which should be enough for the roller blinds. I need the width of the blind to be close to that of the window but there is scope to recess motors into the timber. I guess I need measurements of the motorisation units to figure out what I can do. I'm stiff and saw from laying carpet tiles and moving furniture so have been happy to sit down and do some more web research. Motorised reflective roller blinds sandwiched between the double glass and acrylic sheet should be ideal for the west facing windows. I haven't had a response back from the company I contacted yesterday but the reality is that all I really need from them is the reflective film. I've pulled a roll of "metallised window film" which is designed to be applied to a glass window but it looks fine for using on a roller blind. I can buy roller blinds for $13 each and discard what I don't need as the main mechanism will be from RollerTrol. I had considered nailing strips of timber in place to deal with the 19mm gap either side of the roller. I see on your web site that U and L shaped sections have been successful for blackout blinds. I also noted the desirability of making sure that the bottom rail is sized to miss the blackout guide. I've had a better look at the Vera. One U-Tube video was about turning a light on after sunset and off before sunrise. The date/time and location settings are obviously enough for the Vera to figure out the on and off times throughout the year. I can see what you mean about it being easy to setup the Vera. For my purposes using offsets from sunrise and sunset is all that is required so I don't need to put off automation until next year after all. As you say, the Vera Lite is all that I need. I've checked that the wi-fi access point in the lounge room also supports RJ-45 connections and it does. The Z-Wave capability of the Vera seems to be superfluous for what I need as the RFXCOM unit is what sends communications from the Vera to the motors. However I may add some Z-Wave stuff in the future so I might as well get a Vera that meets Australian standards. I'll get one from the eBay as that is the simplest for both of us. So would you invoice me for 4 of the roller blind kits and an RFXCOM. I just got home and have paid the invoice. Your advice on the Vera Lite was spot on. It will easily support the automation I was going to put off. My heat pump hot water service is set as low as I can set it but heating up more than necessary. That not only wastes power but also water as it causes the relief valve to open. I'm currently turning it off at night but it is still getting too hot. If I put a Z-Wave switch in the circuit I can restrict the hours when the heat pump operates and make sure that is during the day. A heat pump hot water service produces 3kWh of heat from each 1kWh of electricity. I Have 3 small reverse cycle air conditioners and they have a 4 to 1 ratio for heating. My latest stuff is simple compared to what I was doing to handle the wind turbines. See the end panel (control panel at start of article). I ended up buying a device to accept from 12 volts to 52 volts and convert the power to 52 volts to charge the batteries. I later found a device that cost me $22 and did that. That is when I found out that the wind turbines needed to go. I'll send you more photos via separate e-mails. These are photos of the front yard being dug up and a 16K litre water storage being installed. This is a hybrid geoexchange system. I expect the water temperature to be about 15 degrees Celsius all year because of contact with the ground. The air conditioners will get the air via heat exchangers that will cool or heat via water pumped from the tank. Hi John, I do indeed find this interesting; we wouldn't even begin to think about powering our hot water heater here with an off-grid system. So this is waay beyond what we're up to here and I'll be interested to hear how much you need to switch back to grid supply for that. Still, even if it just helps to move the consumption to off-peak hours, that's a major accomplishment. I think I mentioned that this weekend we are being visited by Dr. Terry Carroll, a very wise and clever fellow who has a PhD in theoretical physics. He's here with his son Josh, who is an expert at data analysis, having worked for Microsoft in Seattle for 5 years (he's left Microsoft and doing his own consulting work now). I have copied Terry and Josh on this because they are planning to adopt Vera too, and I think they would be very interested to hear about your project in Oz. Our great friends Burton and Laura Morton are also here from Idaho, to help with the launch of our GrowerNode greenhouse automation system, and they have an extensive background in the growing industry. So the ideas are flying fast and furious around this neck of the woods at the moment. I made up a Vera controlled power board today using second Vera the "faulty" Z-wave switch. All worked well. The licensed electrician had 4 goes at wiring the input neutral and I believe he got it wrong on the final attempt. I've been doing some basic documentation and figured you may be interested whilst most are not. The heat pump hot water service thermostat does not regulate enough. The result is excessive amounts of hot water being discharged via the relief valve. Water and electricity is wasted. Manually turning off the hot water service via the outside switch is a bad option and cannot be done at the right times when I'm at work. The compromise solution has been to turn the inverter on before leaving for work and off on return from work. The wastage is still high. The alternative is to just use the switch/circuit breaker but that also operates on a power point that is used for refrigerators. It is probably a good thing that the original and cheap inverter died. The replacement seems to be efficient when left on in normal mode not power saving mode. The normal arrangement is that the hot water service is powered from the off-grid system and this is most efficient during daylight hours when the air temperature is highest and therefore the efficiency of the heat pump is also at its highest. However in winter months there may be times when it may be necessary to use grid power to cover the deficit of the off-grid system. This is when a peak/off-peak grid power plan should be adopted. Currently Dodo plans provide free power between 6am and 7am. The objective is to minimise the use of grid power and if it has to be used there are two stages. The first is to switch from off-grid to grid for hot water heating only. The second stage is for worse conditions and turns on the feed of grid power to the inverter so that all “off-grid” connections are powered from the grid as well as charging the batteries. The use of a Vera Z-wave controller and Z-wave switches makes it possible to provide the required controls. A big thanks to Adian of Rollertrol for pointing me in the right direction. There have been cold showers for a variety of reasons so the circuit is designed to allow water to be heated when there is no grid power, no off-grid power or the Z-wave components have failed. There is an alternate power input which may come from a petrol generator, an extension cord from the neighbours or simply a grid power point. The design is based on using a Z-wave controller (Vera Lite) and Z-wave switches. A 3-way switch is used to allow power to be sourced from off-grid, on-grid or anywhere else. The Z-wave micro switches are rated at 10 amps which should be adequate but previous experience suggested that they may not be up to dealing with the required loads. Advice was therefore taken to use contactors activated by the Z-wave switches to deal with the load. This sub-project is a spin-off from blind automation in the living room. All worked well when the Vera was close to the control centre. I was not surprised that contact was lost when I put the Vera in the living room. There is roughly the equivalent of 10 bricks to go through and that didn't work. There is now one Vera for the living room and one for the control centre and that works fine. The inverter power is via the hot water/power circuit breaker within the inverter control panel. Auxiliary power is via a male 3 pin socket at the base of the hot water selection module. Input is from the the grid power contactor which is connected via the grid power point above the contactor enclosure. Note that the switched actives 2 and 10 are connected at the 3-way switch so that a single wire goes to the contactor active. Likewise 4 and 12 are connected at the 3-way switch before going to the contactor active. The input active and the neutral of the hot water Z-wave switch are connected to the contactor active and neutral which are powered via the 3-way switch and will be either off-grid or grid powered if the switch is in position 1 or 2 respectively. The load connections of the Z-wave switch are connected to the solenoid of the contactor. Note that the auxiliary power does not go through the contactor but rather to the switched side of the contactor. The switched side of the contactor goes to the hot water service (active and neutral). Note that the auxiliary power also goes to the switched side. The active and neutral connections to the “unswitched” side of the contactor are either off-grid or on-grid depending on the position of the 3-way switch. Position 1 equates to off-grid and position 2 to on-grid. There is no power when position 0 is used. The power point above the contactor enclosure is used to connect active and neutral. The active and neutral connections also go to the Z-wave switch as the input. The Z-wave switch load active and neutral then connect to the contactor solenoid. When active and neutral on the switched side feed through to the grid feed circuit breaker in the inverter control panel. This switch simply takes the input from the grid and switches the grid contactor when required. The 4 roller blind motors were delivered on Sunday. The issue with the first order was that it was over $1000 and I need to pay 10% GST (Goods and Services Tax). If I made it 2 orders Canada Post would have won but as one order the Australian Tax Office wins. I guess you shipped the Vera USB module with the first order so until I get the Custom's clearance I can't play Vera games. I had an electrician install 2 micro Z-wave switches on Friday. One is to automate the switch off of grid power to the inverter/battery charger in Winter should I need to use off peak grid power. The other is to limit the power the heat pump hot water service uses. It has been wasting water and electricity so limiting the time it has power makes sense. I've been manually turning the inverter on and off to deal with the heat pump. With the Vera I was able to set the on and off times. The micro switch rated at 230 volts and 10 amps self destructs in 2 days powering 240 volts and 10 amps. (I'll need to put a contactor in between). The Vera needs to be near my control panel and cannot deal with many brick walls and oblique angles. My Netgear WiFi to cable network adaptor is unreliable with all the stuff I have running. Apart from the above control using the Vera is fantastic. I know the Z-wave approach means that each device is a repeater but I don't believe your USB module is a Z-wave device so have assumed that if the Vera is where it works for the hot water service and grid power that the signal from the USB box won't make it to the blinds. I've ordered a second Vera Lite to deal with the living room. Controlling the power to the hot water service means that the inverter can be left on all the time and also power the main refrigerator, a bar fridge and my computers, modems, printer, routers etc. I didn't know about the $1k threshold; we have the same problem here, except we get charged the GST on almost everything (although it is only 5%, still too much). I have just paid 10% GST plus a $48 import fee. I'll be breaking orders up in future to keep under $1000. I was told the blinds would be delivered today. However I was told yesterday that the place actually making them was about to receive delivery of the fabric and the revised date is 12 December. Needless to say the delivery from Canada wins hands down. Today was my first day off under the new 4 day week agreement. I've spent most of it wiring up the Z-wave control of grid feed in to the inverter for winter - should I need it - and Z-wave and non-Z-wave control of power to the hot water heat pump. I'm using a 3 position switch to feed off-grid, auxiliary and grid power to the hot water service. 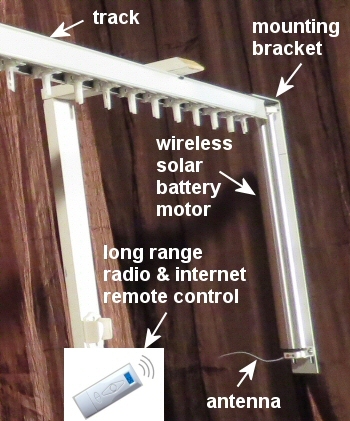 The off-grid and grid positions are Z-wave controlled. The auxiliary is direct and has a 3 pin male plug like those to power monitors from the older computers. If the Z-wave switches fail or I've lost off-grid and grid power and need to use a petrol generator this is the connection to use. As usual there are lots of wires but all bases are covered. Water is collected from the entire roof. Some goes under the house via a manifold and comes up via a manifold into the filters etc. The water is used by the toilets and the laundry but there is enough rainfall to keep the tank full and be used for geoexchange purposes. Back in 1983 I had the satisfaction as Mining Research Superintendent to establish a 2000 point underground monitoring system as well as a computer for numerical modelling of the stability of huge holes created by using open cut mining techniques. I like your project and may be able to help in some small way. The first shipment arrived today after the customs delay. I've got everything I ordered now. Now that I have the actual pieces rather than pictures and videos it is clear that the vertical blind motors for the vertical blinds will be both visible and ugly. The design just does not work in some situations that I avoided. What makes more sense to me is to install the motors horizontally above the pelmet and out of sight and use a 90 degree gearbox to drive the curtains/blinds. Can you provide this or do I need to source it elsewhere? The pelmet is just a board to fasten the vertical blind tracks to. I had to put it up so that the measurements could be taken ASAP. As it is I won't get the blinds until 12 December. Anyway I decided to leave the facing boards until last as this would make installation easy and provide flexibility as to the depth and positioning of the facing board. You will see from the photos that the motors are going to look a bit odd mounted in the normal manner at either end of the north pelmet. There is about 1 metre of brick work between the 2 west facing windows and to maximise the view when the blinds are open there are 2 sets of blinds that pull back to that brick wall divide. Again the motors are going to look odd. As I'm free to extend the facing board above the main board, I figure I should mount the blind motors will horizontally above the pelmet main board. The face board will extend far enough above the main board to hide the motors and wires. It looks as though I can get a reasonably priced right angle gearbox to transfer the motor drive through to one of your standard "idler" units. The PV10 in the PDF is the one I reckon should be OK. The design concept photo shows what I have in mind. The aluminium tube won't be needed. The bracket for fixed end of the motor can be screwed to the top of the pelmet. It is probably simpler to couple the motor shaft to the gearbox directly. The gearbox would also be mounted on top of the pelmet. The "idler" would be turned upside down so that it can be driven by the gearbox via a hole drilled through the pelmet. Coupling the "idler" to the gearbox may be a challenge. I can use the part removed from the end of the motor and cut off a bit of aluminium tube to provide a short coupling between the "idler" and gearbox. The gearbox shaft could be ground down to be the same as the motor shaft. The pelmet timber is 19mm thick. Using the short coupling approach the gearbox horizontal shaft would be about 55mm from the top of the pelmet. The motor support bracket will need a 15mm packer. The maximum height above the pelmet will be the motor at the connection end and be about 75mm. The top of the pelmet face board will need to be 65-70mm higher than the main board to hide the motor and gearbox. If you have a solution that is easier to implement I'm keen to know about it. I omitted the attached photo of the west facing windows. However you can see that the view is such that I'll have to take care of the garden so we can look out from the dining room table. With a standard installation the vertical blinds will be pulled back to the brick divide by 2 motors. They would be visually evident. The west window heights differ as the one to the left is a replacement of an original window whereas the one to the right had its height defined by the new northern glass doors. After spending several hours today on horizontal mounting of the motors I'm now comfortable that I have a good solution. I know you are busy and, in my opinion, should not deal with my specific issues unless they are immediately obvious. I'm expecting to proceed as per my earlier e-mail and will provide more detail as things develop. The right angle gearbox supplier contact details are for Australia and USA/Canada so hopefully that will allow you to expand your offerings is things work as I expect. Just to let you know, the right angle gearbox approach was way too expensive so I've gone for sheave blocks instead. The cost is OK and less hassle is involved. I will use the kits as intended except for mounting them horizontally and changing the direction via pulleys to manipulate the cords. As discussed, I'm mounting 2 of the vertical blind motors horizontally above the pelmet. After much deliberation I've decided that now is the time to automate the tilt as well. Attached are photos of the bits and pieces to use the RollerTrol motors etc for the vertical blinds and the tilt motor and drive. I will use the tiny return pulleys that came with the vertical blinds rather than the big idlers in the RollerTrol kit. The motor assembly will be about a metre from one end as there is an air conditioner above. To automate the tilt I've removed the wand operated tilt traveller, cut off the wand junction and a bit of plastic so that the worm drive feeds in from above and can be coupled to a motor. The tilt traveller will be fixed at the end of the track. I'll use aluminium rod and couplers to have one tilt control operate the 2 sections of blinds. The tilt rod is rotated 6 turns to go from one extreme to the other so servos don't suit. I'm going to use 2 triple axis magnetometers - one fixed and the other on a blind drop - to determine the limits. I'll use and Arduino as the controller and use Infra Red for remote controller. I have a Z-Wave air conditioner IR remote control device on back order and hope that I can use that to add control from the Vera. If not I'll use a standard Z-wave switch to operate a contactor that will switch 3 volt DC. The Arduino can track the "on" duration to figure out whether to tilt open or closed.